Many similar moments later, both online and in the kitchen, I decided I wanted to start my own blog…so for that I celebrate this tart, and the fact that it also inspired me to purchase a removable-bottom tart pan. I rarely use it, but having it in my pan arsenal makes me feel fancy. In my humble opinion, few culinary combinations are as perfect as basil, tomato, and mozzarella. Whether cold in a Caprese salad, toasted in a panini, or hot and melted on a pizza…it’s a winning trio, and I am an ardent fan. This version of the “Big 3” is in the form of a savory tart. 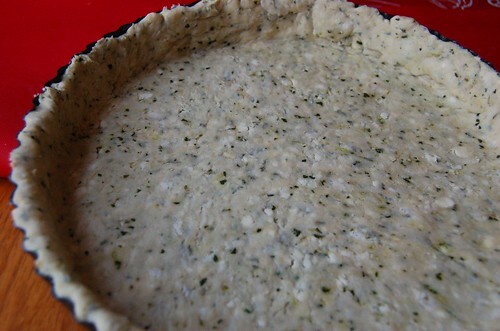 By flavoring the dough for the crust with chopped basil and garlic, you are guaranteeing maximum flavor in every buttery, cheesy, herby bite. Before the filling is added the crust is “blind-baked.” Blind-baking calls for the crust to be lined with foil or parchment which is then anchored down with your choice of pie weight. This process prepares the crust for its filling, while also ensuring that the crust won’t bubble or shrink. My pie weights are dried beans, but you can also purchase ceramic balls or linked steel beads to get the job done. The blind-baked crust (note how my crust shrank anyway from uncooked to blind-baked) is then filled with mozzarella, cherry or grape tomatoes, and basil. An optional sprinkling of parmesan on top, and you’re ready for the final bake. I learned a valuable lesson when I made this for Easter. It should be served hot or at least warm. I was thinking it could be like quiche, and served at room temp. 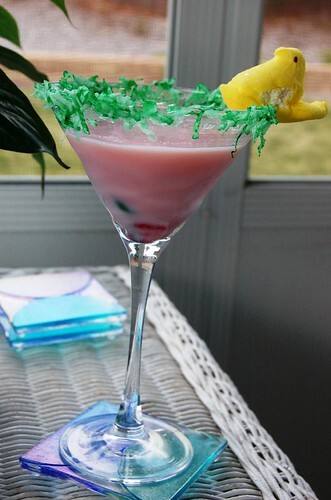 Must have been the Peep-Tini clouding my judgement, because that was a poor assumption. To make the dough, first combine the basil and garlic in the bowl of a food processor. Pulse, scraping down the sides of the bowl as needed, until finely minced. Add the flour and salt and pulse briefly. Add in the cubes of butter and pulse about 10 times, or until the mixture resembles coarse crumbs. Add 3 tablespoons of the ice water and pulse a few times to incorporate. Add 1 more tablespoon and process for several seconds to see if the dough forms a ball. If not, add the remaining tablespoon of water and process until a ball of dough forms. Remove the dough, flatten into a 5-inch disc, and wrap in plastic wrap. Refrigerate for at least 1 hour or overnight. When you are ready to bake the tart, preheat the oven to 425° F. Transfer the chilled dough to a lightly floured work surface and roll out into a 12-inch circle. Lay the dough over a 9-inch round tart pan and press it into the sides. 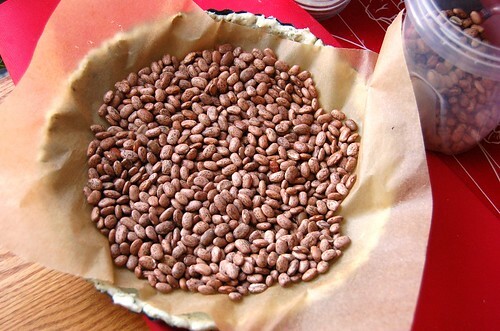 Lay a piece of aluminum foil or parchment paper loosely over the tart dough and fill the center with pie weights or dried beans. Bake for 10-12 minutes. Remove from the oven and carefully remove the foil or parchment and pie weights. Return the tart shell to the oven to bake for another 5 minutes. Remove from the oven and lower the heat to 375° F.
Layer the bottom of the pre-baked tart shell with the sliced mozzarella. Arrange the tomato slices on top of the cheese in a single even layer. Season with salt and pepper. Drizzle with olive oil. Top with freshly grated Parmesan and minced fresh basil. Bake about 30 minutes, or until the dough is golden brown and the cheese is bubbly and lightly browned in places. 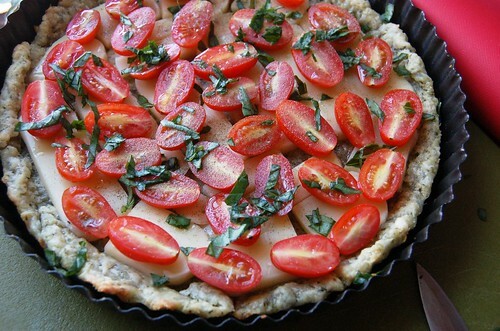 Allow the tart to rest at least 5 minutes before slicing and serving. Do not serve at room temperature! Seriously- this sounds like heaven…literal, complete HEAVEN! I desperately need to make this- perhaps after my King Arthur schooling this weekend! This looks fantastic!! 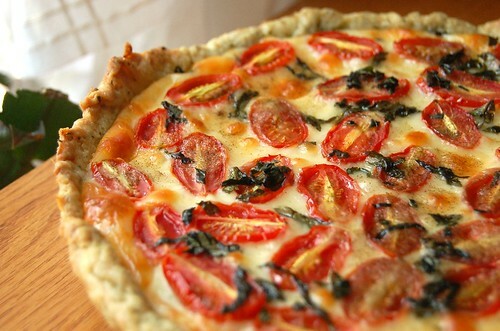 I’ve been looking for some savory tart recipes to add to my summer repertoire – this has been added to the list. Thanks! This looks delicious!! I like that the crust is also ‘made from scratch’. Definately on my list of ‘to make’. That looks absolutely scrum, I love rustic food like this. Great-looking dish. Thought of you this morning. Hope your boyfriend’s family in Monson is safe. They are – thanks so much for thinking of us, Molly! Scary stuff, huh? I hope everyone is alright on your end, too! All of your enthusiasm for this tart has made my day. YOU WILL LOVE IT! This is simply gorgeous! I’ve actually never made a seasoned crust and feel like I am seriously missing out. All the nearby tomatoes better hide because I will be coming for them! Megan – the crust was SO GOOD! 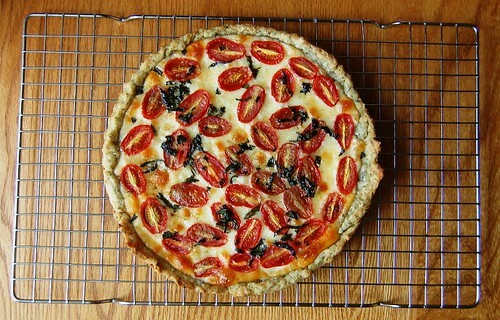 Hurrah for tomatoes coming into season we can enjoy them in savory tarts all summer long! Have been catching up here. 1) love the new look of the blog 2) your photography just keeps getting better 3) where did you find that tin ceiling / wall covering for the background here. gorgeous !!!! Oh this looks so so delicious! Beautiful photos, too. That looks so good. My mouth is watering. I do not own a bottomless tart pan, and am beginning to regret this about my life after reading your enthusiastic description of this dish. Any food that convinced Miss Aimee to become a blogger is a dish that I need to eat! It clearly makes the world a better place.